1. Tejano superstar Selena loved Whataburger. Visitors to her monument in Corpus Chirsti routinely leave flowers and Whataburger meals. 2. Orders can be customized 36,864 ways. 3. There is a smaller chain of restaurants called What-A-Burger that’s based out of Virginia. It was founded a little before Whataburger, and the two chains exist independent of one another. 4. Whataburger has a secret menu. It includes a chicken and pancakes combination and used to feature a drink called the Hulk (a concoction consisting of Powerade and Vault soda). This is due to the restaurant’s almost limitless options for customizing orders. 5. The numbers that come with each dine-in Whataburger meal are a tribute to the company’s original A-frame design. 6. In 1950 a Whataburger cost 25 cents. That was considered expensive compared with McDonald’s 15-cent offering. 7. 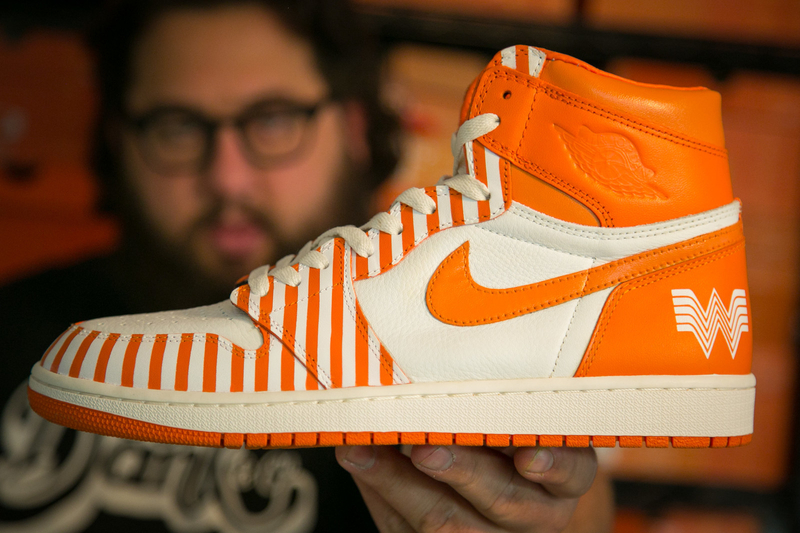 Whataburger has also ventured into footwear. 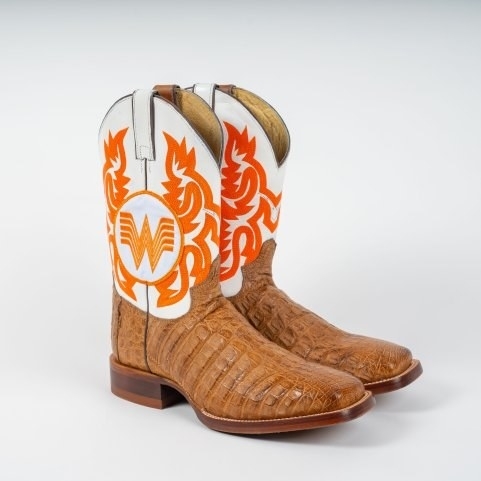 In 2017 they held a contest for a custom pair of Air Jordan 1s, and even made a custom pair of boots for country singer Randy Rogers. 8. You can buy merchandise dedicated to its famous ketchup. 9. The ketchup even has its own conspiracy theory. Each packet is numbered on the bottom. Theorists believe the numbers indicate different taste variations. Management has actively denied these rumors. 10. The franchise has made a few appearances in Kill of the Hill. ‘Cause what would a show with Texas be like without a Whataburger? 11. It is also one of the only fast food restaurants to sell its ketchup in grocery stores. 12. A banner bearing Whataburger’s Flying W logo has been carried to the summit of Mount Kilimanjaro. 13. Contrary to popular belief Whataburger was the first fast food restaurant to use quarter-pound beef patties. Whataburger has been using quarter-pound beef patties since 1950. McDonald’s didn’t start using them until 1971. Various Whataburger teams compete in different events involving operations, corporate history, and customer service. 15. According to the nutrition facts, you’re better off getting a green chile double than a large sweet tea. 16. Austin couple Cheri Horner and Nicole Jensen love Whataburger so much that this past Halloween they decorated their entire home in a Whataburger theme. The hosted a Halloween party that came complete with Whataburger food. 17. One astronaut once requested that a Whataburger accompany him on the space shuttle. 18. There is an actual Whataburger University. No, you can’t get a degree in Spicy Ketchup chemistry. It’s actually a training center for rising in the company. 19. Whataburger matriarch Grace Dobson became chairwoman of the board in 1969. This made her one of the first female head chairs of a top 50 fast food restaurant in the U.S.
20. Whataburger allows horses in the parking lot and drive-thru. 21. A man once drove13 miles in a farm tractor to get Whataburger for him and his neighbors trapped by flood waters. In 2016 Gary Gostecnik of Pattison, Texas had been stuck in his home due to flood waters from the Brazos River. Fed up he got John Deer 8630 tractor picked up his wife and daughter drove 13 miles to the nearest Whataburger. He got food for his family and brought some back for neighbors still trapped by floodwaters. A true Texas hero indeed. 22. The Whataburger flagship store is located on the bay in Corpus Christi, Texas. It is over 6,000 square feet and has a small shop, elevator, and mural inside. 23. People have made such a habit of stealing order numbers that one police department had to issue a warning. In 2017 Northeast Police Department in Denton County, Texas warned against number theft in a Facebook post. They stated citations could be issued for Theft of Property under $100.00. 24. On Valentine’s Day 1996, 24 couples got married at a Whataburger in Dallas. 25. One couple loved the restaurant so much they had a Whataburger themed wedding. 26. Another couple celebrated their golden wedding anniversary there. 27. Whataburger homecoming mums are a thing. Inline with the Texas high school football homecoming tradition, many people in the state make Whataburger-themed mums. 28. Founder Harmon Dobson had quite an eventful life before he started the company. He supervised construction of military facilities in North Africa, was friends with the ruling family of Bahrain, taught himself how to fly a plane, and ran a diamond mining business in South America. 29. William H. Bassett, the gritty voice over actor from the famous Whataburger commercials, is actually from Ohio. Who knew a Midwesterner could do a Texas twang so well. 30. In coastal regions, Whataburger offers tracking maps for hurricanes and tropical storms. 31. One super fan got his entire room decked out in Whataburger decor. In 2017 Enrique Alcoreza decorated his resident hall at Trinity University with handmade Whataburger decor. 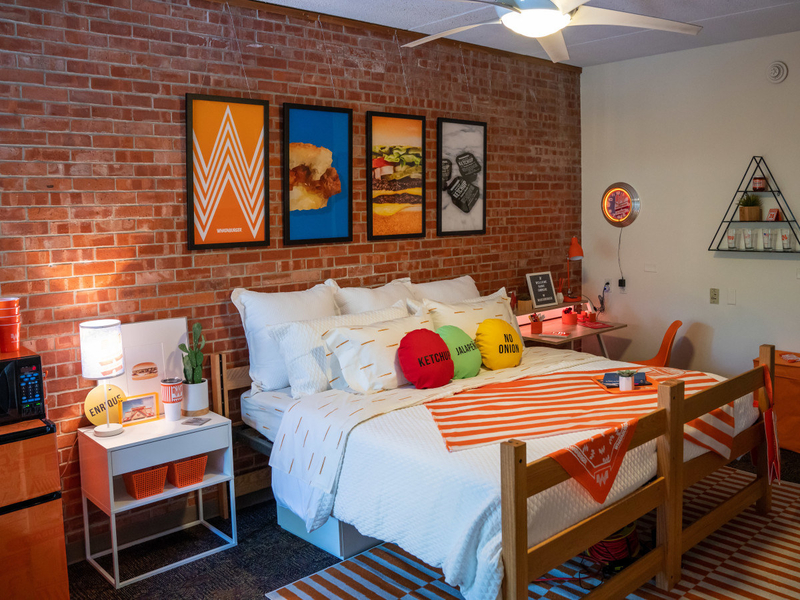 The company rewarded his passion with a full-on Whataburger decorated dorm room. 32. Although they were discontinued in 1973, 15 A-frame restaurants are still in operation.